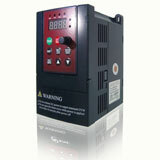 Generally, there are dozens of function parameters in frequency inverter, or even hundreds for option. In practical application, it is not necessary to set every parameter, most parameters can be keep factory default settings. Acceleration time is the time required by output frequency from 0 Hz to the maximum frequency, deceleration time is from maximum frequency dropped to 0 Hz. Usually use the frequency setting signal rise and fall to determine the acc/dec time. It needs to restrict the rise rate of the frequency in acceleration during the electric motor start period in order to prevent over-current, and limit the frequency decrease rate in order to prevent over-voltage during deceleration period. Acceleration time setting requirements: limits the speed up current below the frequency inverter over-current capacity, make the over current speed loss don't cause the frequency inverter tripped; The deceleration time set point is to prevent smoothing circuit voltage excessive, make regeneration overvoltage don't cause the inverter tripped. Acc/dec time can be calculated according to the load, but to practical experience it's better to set longer acc/dec time at the debugging, to see if there are over current or over voltage alarms during the electric motor start/stop; Then shorten the acc/dec time gradually base on the principle with no alarm in operation, repeat several times, you can determine the best acceleration and deceleration time. Also known as the torque compensation, it's to compensate the torque decrease in low speed for the stator winding resistance of the electric motor, by increase the low-frequency range of V/F. It's enable the voltage during acceleration goes up automatically to compensate the starting torque when its set to AUTO, to ensure the electric motor accelerates smoothly. Adopting manual compensation, you can get better curve through test according to the load characteristics, especially the load starting characteristics. For variable torque loads, the output voltage maybe too high in low speed by the inappropriate chooses, to cause a waste of electricity energy. This function is set to protect the electric motor from overheating, it calculate the electric motor temperature rise by the frequency inverter internal CPU base on the operation current and frequency, thus to enable overheating protection. This function applies to "one inverter drag one motor" only, it should be installed thermal relay on each motor when you want one frequency inverter drag several motors. Electronic thermal protection setting value (%) = [electric motor rated current (A) / inverter rated output current (A)] × 100%. 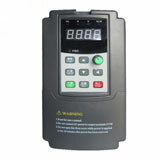 Means the frequency inverter output frequency maximum and minimum value. Frequency limitation is to prevent the failure of impropriate operation or external frequency setting signal source from outputting frequency too high or too low, it's a protective function to prevent damage the devices. In the application you can set it according to the actual situation. This feature can also be used for speed limiting, like in some belt conveyors, due to not so many materials being transported, adopt the frequency inverter to reduce the wear and tear of machines and belt, by setting the inverter maximum frequency to a certain value, this allows the conveyor belt running at a fixed, low speed status. Sometimes it's called deviation frequency or frequency deviation setting. Its purpose is when the frequency is set by an external analog signal (voltage or current), use this function to adjust the output frequency value when the frequency setting signal in minimum value. Some frequency inverters deviation value is available from 0 to max when the frequency setting signal is 0%, some frequency inverters even can be set on the bias polarity. In debugging, when the frequency setting signal is 0%, the inverter output frequency is not 0 Hz but x Hz, then the deviation frequency can be set to negative x Hz to enable the frequency inverter output frequency 0 Hz. This feature is only effective when the frequency set by external analog signal. It is used to compensate the inconsistencies between the external setting signal voltage and the frequency inverter internal voltage (+10v); at the same time it's convenient for voltage selection of the analog signal, in setting, when the analog input signal is maximum (10v, 5v or 20mA), obtained the output frequency percentage of V/F graphics and treat it as a parameter to set it; Take an example, external setting signal is 0 - 5v, inverter output frequency is 0 - 50Hz, then signal gain value is set to 200%.